Motor Power: 3 H.P., 5 H.P. , 7.5 H.P. - Is able to cut both radial and nylon tyre rubber. Rubber bale cutter is used to cut bales of rubber in different sizes. The machines have rollers that ensure the easing of the movement of bales. We have both, semi and fully automatic cutters. These are suitable for the toughest natural and synthetic rubber bales. Vee Enn Industries offers a Hydraulic Bale Cutter. 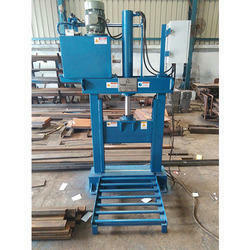 This is a hydraulically operated bale cutter with 24 x 16 daylight area. 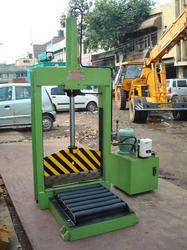 We are one of the reputed organizations manufacturing and selling Rubber Bale Cutter. This machinery is suitable for cutting natural and synthetic rubber bales. Rubber Bale Cutter works on Conveyor belt. Our Rubber Bale Cutters have the features like high precision, enhanced quality cutting and least maintenance. We use heavy duty stainless steel in the manufacture of this cutter. We are the topmost company providing Bale Cutter to the clients. This product is manufactured by high class materials and high technology. Our range of offered Bale Cutter is used for cutting both natural and synthetic rubbers with accuracy and precision. This product is available in affordable prices in leading market. Motor Power: 3 to 7.5 H.P.